As the holiday season approaches, I knew I wanted to incorporate a fun craft into language therapy using my EET kit. For a particular group of second graders, I created a Christmas tree decorating craft using the EET framework and some of the materials that came in the EET kit provided from WHAS Crusade for Children grant. These students are familiar with the color-coding system for describing objects, as we have been working on this task for quite a while. During a therapy session, we used the color-coding system to decorate a Christmas tree using ornaments that are color-coded exactly to match the EET framework. Each student took turns rolling the two EET dice and drawing one of the vocabulary cards from a pile. The student then described the object on the card using the two attributes that match the colors on the dice (for example, if they rolled green and blue, they stated the group and function). 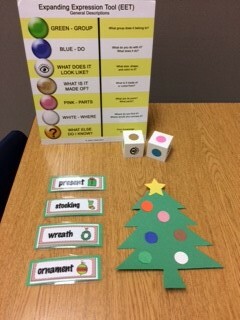 Once the student correctly described the object using two attributes, they were able to put two ornaments on their tree that matched the colors they rolled (following the previous example, the student would put a green and blue ornament on the tree). Repeat this until all students have had multiple turns describing objects and decorating their Christmas tree.